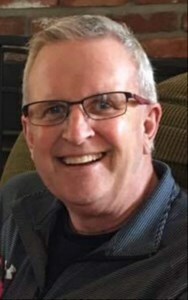 James Eric Postlethwait, 62, of Olathe, passed away on April 11, 2019. He was born on November 17, 1956 to James and Roberta (Hilt) Postlethwait in Warrensburg, MO. James “Eric” Postlethwait graduated from Warrensburg High School in 1975. His passion was creating jewelry designs and received his GIA in 1987. He was in the jewelry industry for over 25 years and enjoyed sales and meeting new friends. His hobbies were anything to do outdoors and he loved the lake as well as his Missouri Tigers and golf. He truly enjoyed spending time with his children and five beautiful granddaughters. Eric is survived by his loving children, Melissa Hockett (Brian) of St. Louis, Missouri, Mallory Smith (Timothy) of Gardner, Kansas and James Miles Postlethwait (Jessica) of Olathe, Kansas; his siblings Chris Postlethwait (Vada), Jeanette Nault (Mike), and Cynthia Cox (Brad). He will be remembered by his granddaughters Macie and Blakely Hockett, Mackenzie, Mayva, and Madelynn Smith. He was preceded in death by his parents, James and Roberta Postlethwait. The family will receive guests for a visitation on Thursday, April 18, 2019, from 6:00-8:00pm at Penwell Gabel's Olathe Chapel. A memorial service will be held at 2:00pm on Friday, April 19, 2019, also at Penwell Gabel. 1520 Cherry Street, Kansas City, MO 64108. Add your memories to the guest book of James Postlethwait. I was lucky enough to grow up 3 houses down and have been friends with Miles since I was about 4. So I have a lot of great memories of Eric. The all-time best memory I have: We were probably in 5th or 6th grade. I road with Miles & Eric to our baseball game. It got cancelled because of tornado warnings, so we turned around to go home. But we stopped at the grocery store. Miles and I were looking at magazines and comic books while they shopped. The whole time my stomach was getting upset, ended up having the flu, but I tried to make it through. Eventually we stood in line, and Dad-mode must have kicked in for Eric, because he saw in my face that I was almost at the point of no return. He scooped me up with his hand covering my mouth and literally ran me to the bathroom. Just in the knick of time. Overall, Eric was just always a fun and caring person to be around. I'm very glad to have gotten to grow up around someone like him. He will be missed. Eric is no soaring with the eagles and no longer in pair. Rest in peace my friend. What a special guy Eric was! He was always smiling & laughing whether he was tubing with the kids, trying the fly board, making snow angels or just chatting up some strangers who then became his friends! On vacation, he made so many new friends that we made him a t-shirt that said, “Vote Eric for President of the World!” He also cared very deeply about many things. He was our “go to” guy for any questions about properly caring for the American flag! He was always willing to help out....even when I asked him to volunteer at the homeless shelter until 2am. Eric was early to bed and early to rise so that was a tough one for him, but he did it because I asked him for his help. Eric was loved by many, including the Goodman family, and he will be deeply missed!! RIP dear friend! Eric was a great man & will be missed by many.My prayers are with family & friends. Eric was a great guy with an infectious smile and spirit. I'm going to miss my friend. I pray for comfort and peace for his family. I was blessed to have had Eric as my friend for the past few years. He had a smile, laugh and outward Joy that was contagious. We shared a few meals & Chiefs Games plus a bunch of laughter. I will miss him.